"I only went out for a walk, and finally concluded to stay out till sundown, for going out, I found, was really going in..."
Well exactly. John Muir knew what we was talking about. We go up into the Sierra to get away from it all. That means leaving as much of the stress of our busy lives at home as we can. When we go up into the mountains, we really love the peace, the quiet and the simplicity of that life. And that’s how we approach our backpacking. How does that play out on the trail? It means we think about weight, cost, and complexity. We like light, cheap, and simple. Hiking is work. Hiking carrying a backpack at elevation is even harder work. And hiking uphill in those conditions is really hard work. Don’t let anyone tell you otherwise. When you get to our age, hiking downhill with a backpack is also hard—particularly on our knees. You don’t have to be an athlete to do it, but you don’t have to be an idiot about it, either! All that to say that we like to pack relatively light. If you check out our equipment list, you’ll see it doesn’t have an iron skillet for frying fish or pancakes. It also doesn’t have much in the way of wine, beer or spirits. In fact, just about every item on that list is something we have looked at with a very careful eye, weighed it in our mind (and also on a scale!) and then decided that we really did want to add that to our pack weight. 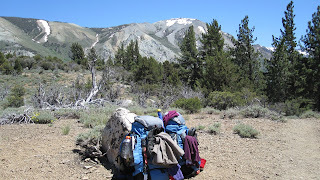 We don’t carry as much stuff as some people we’ve met on the trail. At the same time, we are basically opposed to spending gobs of money on things. Our entire initial backpacking kit, for two people, cost us under $400 total. That included two packs, two sleeping bags, tent, stove, cook kit, water filter, and all the trimmings. Some people, who probably spend less time in the mountains that we do, have spent that much on a single sleeping bag. Good for them—but we often don’t see the point. Take the time to go into our equipment section for more details on this. We like to find simple and cheap solutions. For example, there are truly wonderfully designed and manufactured water bottles on the market, some of which cost up to $30. We often use use a couple of 32 ounce soda bottles. They cost nothing. They weigh 2 ounces each when they are empty. They work great. And we even feel a little happy about the fact that they are not clogging up some recycling center somewhere, or unconscionably dumped into a landfill. And we’ve learned to simplify our life when we backpack. We look for pieces of equipment that perform more than one function. We’ve taken a couple of small pieces of an old closed cell foam sleeping pad, and we use them to sit on when we rest on the trail or in camp. They weigh nothing. They slip into the bungie cords on the back of our packs. And P uses them at night as the bottom layer of his pillow. Light. Cheap. Simple. Each piece of our equipment has a very specific function, and we enjoy the process of thinking through how we can make things even simpler and lighter. We don’t try to get too Zen about all of this, but there is a real beauty in understanding that to every thing there is a purpose…and nothing is wasted, nothing is extraneous. It adds to the charm of arriving in camp and knowing where each thing is, and where each thing should go. As a couple, we find this has really been a wonderful part of our relationship, too.